Did someone tell you that you sleep with your eyes open? Chances are, you had no idea your eyes aren't completely closed while you are asleep. If you sleep with your eyes open, or at least your eyelids only partially closed, is called nocturnal lagophthalmos. It tends to be rather common in young children. However, they often outgrow the condition. It is also common in older people due to changes in the eyelid tissue. Nocturnal lagophthalmos can also occur during the day. Patients with this condition do not have a full blink, so there is always a part of the eye that does not receive enough tear lubrication. When your eyelids do not fully close, your eyes are exposed to the open atmosphere. Because they function to lubricate the surface of your eyes, your eyes begin to dry out significantly. You may wake in the morning feeling like your eyes are dry, tired, and/or itchy. Your eyelids provide a barrier, allowing tears to lubricate the surface of your eyes. Along with nutrients, tears have natural antibiotics to help kill viruses and bacteria. When the barrier is broken, your eye becomes exposed to the outside environment and the tear film begins to evaporate almost immediately. When this occurs night after night, your eyes can become inflamed and the cornea and conjunctiva may form dry spots, ulcers, and even scarring if not treated. It may sound strange, but nocturnal lagophthalmos is actually considered a form of facial paralysis; it involves the orbicularis muscle in the eyelid and may be temporary or permanent. It can be caused by several things, including Bell's Palsy, infection, stroke, surgery, and trauma. Lagophthalmos may also develop after undergoing upper blepharoplasty. Blepharoplasty is a procedure used to remove excessive skin on the upper eyelid (suprapalpebral hooding) that often occurs with aging. The procedure can help you see better as well as look younger. However, if too much upper eyelid skin is removed, the lagophthalmos may develop. Obviously, unless you video yourself while sleeping, you won't realize you sleep with your eyes open until you experience symptoms. If you suffer from nocturnal lagophthalmos, you may awaken with dry eye symptoms such as feeling like something is in your eye, redness, pain, and blurry vision. Some people also complain of increased light sensitivity. Lagophthalmos is actually often confused with chronic dry eye syndrome, as true symptoms closely mimic each other. Your eye doctor will be able to determine if you are suffering from dry eye syndrome by conducting a comprehensive eye exam. Your tear production can be measured to make sure your eyes are producing adequate moisture. The Schirmer test is used to measure your tears. During the test, small strips of paper are placed under your lower eyelids. After a few minutes your doctor will measure how much of the strip was soaked up by your tears. Other tests can be used to determine the quality of your tears. Special dyes in eyedrops can be instilled in your eyes to determine the surface condition of your eyes. Staining patterns on the corneas will determine the amount of time it takes your tears to evaporate. Treatment usually involves artificial tear eye drops given several times per day along with instillation of a bland eye gel or ointment at bedtime. 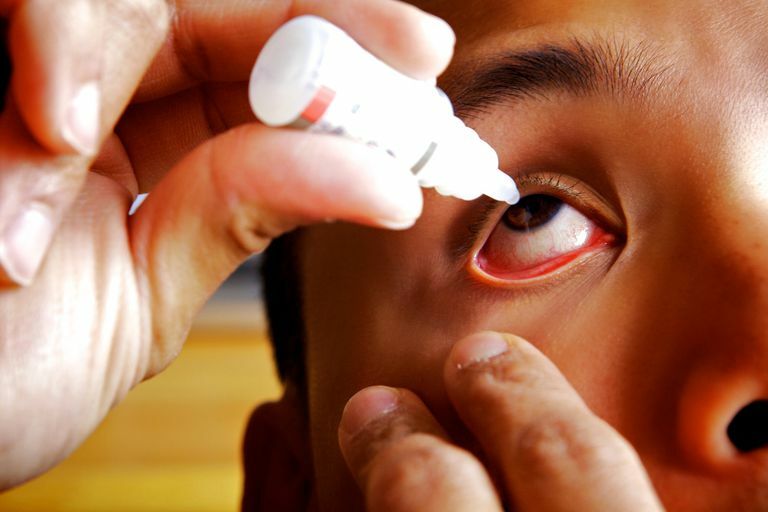 Ointments may be applied to the cornea at bedtime in severe cases. Because ointments can cause vision to blur, most people can only tolerate them during sleep. To prevent the eyelid from opening at night, medical grade hypoallergenic tape may be gently applied to the eyelid to keep it closed. A mask worn over the eyes may also help. Your doctor may also recommend that you turn down or turn off ceiling fans. In severe cases, a gold weight may be applied to the outside of the eyelid or surgically implanted inside the eyelid. The gold weight is compatible with the body and uses nature’s gravity to help provide a full blink. Don't be afraid to ask your doctor if you might be experiencing lagophthalmos. Sometimes it is difficult to know, as your eyes may be dry due to other causes such as dry eye syndrome. However, the effects of sleeping with open eyes can be severe. Treatments could significantly improve your quality of life. Lawrence, Scott D. and Carrie L. Morris, MD. Pearls. Lagophthalmos Evaluation and Treatment. American Academy of Ophthalmology, 2017.